2.1 What is the NFQ? 2.2 What do the 10 levels relate to in practice? 2.3 Who is the awarding body? Is it QQI or FETAC? 2.4 Are QQI Qualifications Quality Assured? 2.5 Are my QQI Qualifications recognised internationally? I would like to take this opportunity to thank you for booking with Professional Development on a QQI certified course. This course is eligible for a QQI award. The purpose of this handbook is to provide you with a comprehensive reference tool to assist with all aspects of the course including the procedures for submitting your assessment for grading, the notification of your grade, the appeals process etc. I would strongly recommend you take some time to study this document carefully ahead of your course. By attending a QQI certified course delivered by Professional Development (in whole or in part), you are expressly acknowledging acceptance and adherence to all procedures outlined in this handboook. If you have any questions in relation to any aspect of this handbook, please feel free to contact your customer service representative who will be happy to chat with you. I wish you every success in your course and your future career, and thank you for choosing Professional Development for your training needs. Professional Development is a QQI quality assured course provider. 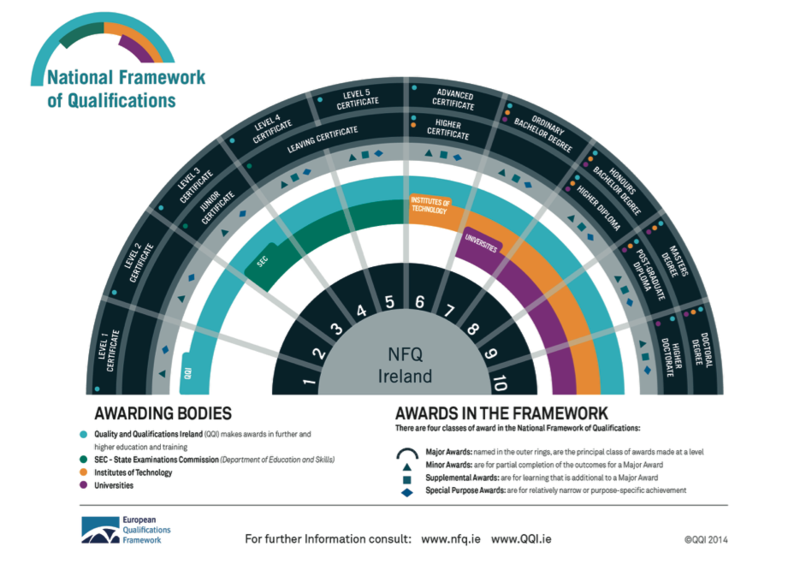 All QQI branded courses run by Professional Development are eligible for certification for a QQI award recognised under the National Framework of Qualifications (NFQ). Professional Development has been in business for over 26 years and offered QQI (formerly FETAC) accredited courses since 2006. Professional Development’s QQI Centre Number is: 30838N. QQI stands for Quality and Qualifications Ireland. QQI was established in November 2012 as a new integrated agency replacing the Further Education & Training Awards Council (FETAC), the Higher Education & Training Awards Council (HETAC), and the National Qualifications Authority of Ireland (NQAI). FETAC, HETAC and NQAI are now dissolved. QQI is responsible for the external quality assurance of further and higher education and training (including English language provision). It validates programmes and makes awards for certain providers in these sectors. Awards and qualifications formerly made by FETAC continue to be recognised, because they are on the National Framework of Qualifications. 2.1	What is the NFQ? The National Framework of Qualifications (NFQ) provides a way to compare qualifications, and to ensure that they are quality assured and recognised at home and abroad. QQI is also responsible for the maintenance, development and review of the National Framework of Qualifications (NFQ). The NFQ is based on ten (10) levels. Each level is based on nationally agreed standards of knowledge, skill and competence, i.e. what a person is expected to know, understand and be able to do following successful completion of a course. School qualifications awarded by the State Examinations Commission, further education and training qualifications formally awarded by FETAC, and higher education and training qualifications awarded by HETAC, DIT, other Institutes of Technology and the Universities are all included in the Framework. 2.2	What do the 10 levels relate to in practice? 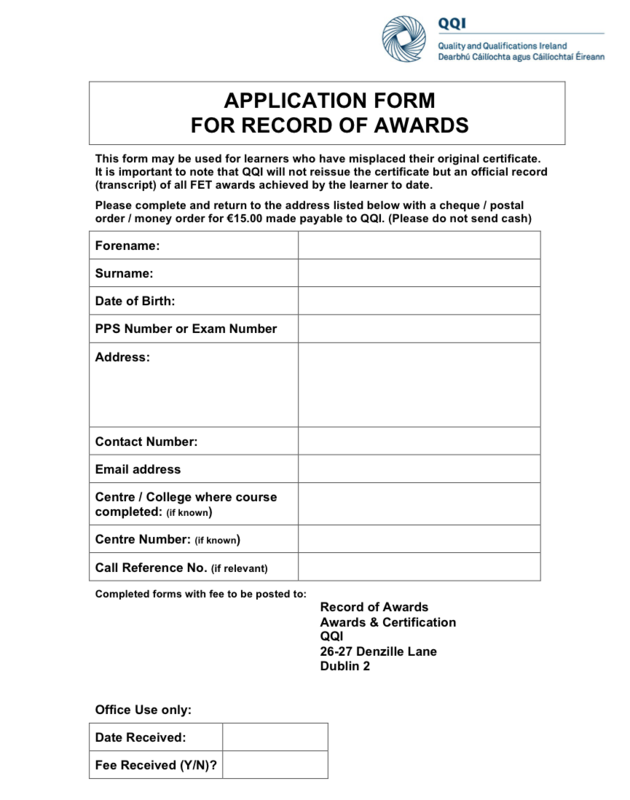 Level 1 is the lowest level and level 10 is the highest. Level 10 would equate to a PhD or Doctorate Degree from a University. Level 3 is equivalent to the Junior Cert. Levels 4 & 5 are equivalent to the Leaving Cert. The old FETAC qualifications run from Level 1 to Level 6. All our courses are either Level 5 or 6 under the NFQ. 2.3	Who is the awarding body? Is it QQI or FETAC? The awarding body is now QQI for Professional Development courses. FETAC was previously the awarding body, but FETAC has now been amalgamated with QQI (since Nov 2012). 2.4	Are QQI qualifications quality assured? Quality Assurance is central to the National Framework of Qualifications. Quality assurance means that your education and training programme, and the organisation providing it (Professional Development), are reviewed on a regular basis. Professional Development is a QQI (formerly FETAC) quality assured training provider since 2006. 2.5	Are my QQI qualifications recognised internationally? All qualifications in the NFQ are recognised at home and abroad. Quality assurance procedures in use in Ireland follow European guidelines and recommendations. There are two qualifications frameworks at European level. European Qualifications Framework (EQF), which deals with all levels of the NFQ including schools, further education and training, and higher education and training. The full name of the ‘Bologna framework’ is the Framework for Qualifications of the European Higher Education Area. The full name of the EQF is the European Qualifications Framework for Lifelong Learning. The two European frameworks are compatible with each other. The NFQ was referenced to the ‘Bologna framework’ in 2006 and was referenced to the EQF in June 2009. This means that qualifications in the NFQ can be looked at to decide how they compare to those of other countries. Qualifications in the NFQ are thus more widely recognised and easily understood abroad. Therefore, we are required to collect this information from you. If you choose not to disclose this information we cannot submit your grade to QQI and you will not be eligible to receive a certificate. Please note that the information is collected solely for the purpose outlined above and is stored securely on-site at our offices in Dublin. This information is never disclosed to any third parties (other than QQI). Please refer to a separate information document prepared by us for Learners entitled “Data Protection FAQ”. This will provide you with further detail on; the Data Protection Acts (“the Acts”), how it affects you, your rights and our obligations under the Acts, and the requirement for us to collect, store and share Personal Data provided by you. In order to be eligible for a QQI award you must be in possession of a valid Personal Public Service Number (PPSN). A Personal Public Service Number (PPSN) is a unique reference number that is to be used by you in all dealings with Public Service Agencies and Government Departments. The Department of Social Protection (DSP) allocates all PPSNs. More detailed information in relation to PPSNs, including whether a PPSN has already been issued to you, where you might find your PPSN, how to apply for one if you are moving to Ireland etc. is available on the Department of Social Protection website (www.welfare.ie). Our “Data Protection FAQ” document also addresses why we collect PPSN details from Learners, how we are authorised to do so under the Social Welfare Acts, and how we store and share PPSN details with QQI. If you have any specific questions in relation to this matter please contact our office and we will be happy to discuss these with you. If you are a UK citizen with a valid National Insurance Number (UK PPSN equivalent) you are eligible to apply of a QQI award. Other EU citizens are not eligible to apply for a QQI award (unless they are already in possession of a valid PPSN). All communication from Professional Development with learners is by way of e-mail. You must provide a valid e-mail address for all correspondence in relation to your QQI course. It is your responsibility to check this inbox regularly to ensure that any time sensitive e-mails from us are brought to your attention as soon as possible. In particular, this applies to communications regarding your grade and / or assessments. We cannot be held liable by your failure to respond within the set deadline for appeal of grades or re-submission of assessments. If you cannot provide a secure personal e-mail address, you will not be eligible for certification, as we will have no means of communicating with you. Please note that personal, confidential information regarding your assessment will be emailed to you at whatever e-mail address you provide to us. Please bear this in mind when deciding which email to provide. It is your responsibility to inform us promptly of any changes to your contact details; postal address, e-mail address, phone number as soon as possible to ensure our records are kept up to date. As part of our customer service focus we are committed to ensuring that you have good experience in dealing with Professional Development. If you have any questions or concerns please contact your customer service representative. We welcome all feedback both positive and negative as it facilitates us to continuously improve our offering to our customers. If you wish to make a complaint about any aspect of our service please let us know. As you will appreciate, in order for us to deal with a complaint we must have the complaint in writing. An e-mail from you will suffice. Please send any complaints directly to your customer service representative. We will endeavour to revert to you as soon as possible. If you are not satisfied with your grade you have the right to appeal. Please refer to Section 11, Appeals. You must attend the entire course to be eligible for certification. If you only partially attend the course, you will be ineligible for certification. If you need to attend subsequent additional days on another date of the course to complete the training requirements, this will be charged on a pro-rata basis. An important part of the QQI certification process is that you undertake self-directed learning, post completion of the course. This takes the form of various written assessments that are completed by you to demonstrate that you have met the learning outcomes required for QQI certification. It also involves additional reading and research, applying the learning from the course, reflection time and study time. The level of work required depends on the level of the certification under the NFQ (see Section 2.1), but it will invariably involve soome time commitment from you after completing the course, and in cases where a Skills Demonstration is part of the assessment, on evenings during the course. Please ensure that you plan for this. In order to optimise your chance of achieving the best possible results, we recommend that your asssessments be completed as soon as possible after the course. While some unforeseen circumstances may warrant an Extension ("Extension") to your assessment deadline, this cannot be guaranteed and will be dealt with on a case-by-case basis (please refer to Section 6.6 - Requests for an Extension). Your assessments must be your own work. You cannot borrow or copy work from other sources on the Internet, books or journals (refer to plagiarism in 6.3 below), work colleagues or family members. If you use content rightly attributable to a third party (academic, scholar or Author etc.) you must give full credit using a footnote or bibliography. Please refer to your Assessment Brief for further details. Plagiarism is unacceptable, and must be avoided. If you are in any doubt as to what constitutes Plagiarism please consult the Professional Development guidance note on referencing entitled “Guidelines for Referencing and Bibliography”, which is made available to all Learners. Your assessment(s) will be either severely marked-down or receive no marks if there is reasonable evidence to suspect that you have plagiarised third party content and passed it off as your own. You will be given clear instructions as to the deadline for submission of your written assessment. Failure to adhere to this deadline may result in delays in receiving your QQI certificate and/or could result in your assessment being rejected for grading if an extension is not granted (please refer 6.6 below). As part of your assessment procedure you may be required to complete a skills demonstration that will be recorded using a video camcorder. The video is solely to provide documentary evidence to justify your grade. It is required by QQI as part of their quality assurance and authentication process. We cannot provide delegates with copies of these videos. Your trainer will mark your Skills Demonstration, which will then go through our Grading Process (refer 7.0 Grading Process). By attending the course, you are giving us your consent to record you on video. Please note that if subsequently withdraw your consent you will not be eligible for certification and we cannot submit you grade to QQI. An extension of your deadline for submitting your assessments ("Extension") will only be given in extenuating circumstances (family bereavement, illness) and at the discretion of Professional Development. Any extension to your deadline must be adhered to. We reserve the right, at our absolute discretion, to request documentary proof (letter from a G.P. or Consultant) of the need for an Extension. Only one Extension can be requested, and failure to submit your assessments on or before the Extension deadline will result in you being ineligible for certification. All assessment work must be in submitted in electronic format only. All assessments must be submitted by e-mail to assessments@professionaldevelopment.ie. We cannot accept assessments in hard copy format. Please do not post your assessment to us. Any assessments received in hard copy format will be returned to you ungraded. It is your responsibility to ensure that the correct / final version of your assessment work is submitted for grading. The version of the assessment submitted by you will be the one we grade. You cannot subsequently change the assessment work unless the assessment work has not yet been graded, and the deadline for submission has not expired at the time of your request to replace / upgrade your assessment with an updated version. Once your assessment work has been submitted for grading you cannot decide to withdraw the assessment. By submitting your assessment(s) you accept to be bound by the grade, subject to any appeal (refer 11.0 regarding Appeals). If your assessment grade results in you receiving a fail grade you will be notified and given the option to resubmit (refer 9.0 regarding Fail Grades). If you receive a fail grade and decide neither to appeal your grade nor to re-submit your assessment (if you fail), your fail grade will be deemed final. We do not submit fail grades to QQI. Your assessment work must be prepared in electronic format and must be saved as an Adobe Acrobat file (PDF file). It must include all appendices, bibliographies etc. as a single file. Failure to adhere to this format may result in your assessment work being rejected. We cannot accept assessments in any other format (hand written, traditional typed scripts or Audio files (such as Dictaphone). Please do not include your PPSN or date of birth along with your assessment, either in the body of the assessment submitted by you or in the covering e-mail. If you do, we will have to reject the assessment for Data Protection reasons. PPSN and date of birth details should be submitted to us separately. Storage and access to this Personal Data is strictly controlled in accordance with our Data Protection Policy. You must submit all written assessment work. If you do not submit all written assessments you will be ineligible for certification. There are cut-off dates in place for 2016 for submission of assessment work for grading and subsequent submission of grades for certification. Please refer to Appendix 2 for further details. Once all written assessment work has been received it will be sent forward for grading by a QQI Assessor retained by us. The Assessor will grade your written assessment and all assessment work (written assessments and skills demonstration where applicable) will go through a three-stage review process before the grade is deemed final (subject to appeal). All grades must go through an Internal Verification (IV) Process. As part of this process, grades are sample checked using QQI approved procedures with particular attention to Learners whose grades are on the cusp (+/-5%) of a grade band. Once Internally Verified they are sent forward. Persons independent of grading process complete the IV. These individuals are employees of Professional Development and their role is primarily a quality assurance one. They are not involved in grading. Once grades have been through IV, they are they reviewed by an External Authenticator (EA). The EA reviews the grades being put forward for certification and similar to the IV, sample checks a number (based on QQI guidelines) to ensure grading is consistent and fair. This review will involve a review of all documentation submitted by the Learner that was marked in arriving at their grade (Skills Demonstration, Projects, Assessments etc.). The EA will pay particular attention to learners whose grades are on the cusp of a grade change (+/- 5%). The EA may recommend a grade change. The EA will then produce a report summarising their findings and this is made available to the Results Approval Panel who have ultimate authority to approve all grades before being submitted to QQI for certification. Once the EA has issued their report, the Results Approval Panel (RAP) will meet to consider the finding of the EA and discuss any grade changes. The RAP will approve the grades which are considered final subject to any appeal (refer 11.0 below). Only when the results have been approved by the RAP can they be disclosed to Learners (refer 10.0 below for further details). The following grade bands apply to all QQI validated courses. Once your grade is final, your QQI certificate (once printed) will record your grade. It will not refer to your % marks. We do not submit fail grades for notification. If you achieve a fail grade you will receive a notification from us and you will be allowed one further opportunity to resubmit your assessment(s) for grading subject to certain strict conditions (refer 9.0 below for further details). If during the grading process, we become aware that you have not achieved a minimum of pass grade (i.e. you have failed), you will be notified by e-mail from assessments@professionaldevelopment.ie (“Fail Grade Notification”). We do not submit fail grades to QQI. You will receive an official letter from us by e-mail notifying you of your grade. You will not be notified by either phone call or text as we have to be consistent in the information provided to all learners. As per clause 3.2 above, please ensure you actively monitor your e-mail for any communications from us regarding your grade and / or assessments, and please deal with these e-mails promptly to ensure you do not miss any deadlines for re-submission, appeal etc. As part of your Fail Grade Notification you will receive feedback on where you lost marks and general areas for improvement. This feedback is intended to help you identify areas where you can focus your efforts to improve your grade and achieve a pass. You will also receive a breakdown of your marks for each assessment technique. If you have achieved a fail grade and choose to resubmit your assessment, you will be given a deadline of 14 days (2 weeks) from the date that the fail grade notification e-mail is sent to you. If you do not re-submit (to assessments@professionaldevelopment.ie) within this deadline we reserve the right, at our absolute discretion, to refuse to accept the resubmitted assessment for re-grading. It is your responsibility to ensure you adhere to this deadline. You will not be prompted by phone, text or e-mail before, on, or after the expiry of this deadline. If you receive a Fail Grade Notification, either for your initial assessment or your re-submitted assessment, you may if you wish appeal the grade. Please refer to 11.0 below for further detail on appeals. Please note that if your appeal is unsuccessful, you cannot re-submit your assessment and you cannot re-appeal. If you choose to re-submit, please note, the maximum grade you can achieve is a Pass. There is therefore no benefit to you in appealing a Pass grade on re-submission. If after you re-submit your assessments, you do not achieve a minimum of 50% (i.e. a Pass), you will receive a Fail Grade Notification by e-mail. As outlined in 9.0 above, you will not be notified by either phone call or text. You may appeal your Fail Grade (refer to Section 11.0 Appeals). Your grade (Distinction, Merit, or Pass) refer 8.0 above for further detail on QQI grade bands). You will also receive a breakdown of your % marks by assessment technique (Learner Record, Written Assignment, Skills Demonstration etc.). You may appeal your grade subject to certain conditions. Please refer 11.0 below for further detail on the Appeals process. When we send you your Provisional Notification of Results letter we will include your name as it appears on our records. Please check to ensure there are no spelling errors and/or the name as printed is what you would like to appear on your QQI certificate. If we don’t hear from you within 7 days of the date we send you your Provisional Notification of Results, we will assume the name is correct and this is what will be submitted to QQI for printing. Please note there is a charge of €15 for any reprinting of certificates once they have been received by us from QQI (refer 12.0 below for further details). Where your employer has funded the cost of the course on your behalf, we may, at their request in writing, furnish them with a copy of your results. We will not share any Personal Data with your employer, only your grade and % marks. Once you receive your Provisional Notification of Results by e-mail you may if you wish, have an opportunity to formally appeal your result. Any formal appeal must be made in writing and sent to assessments@professionaldevelopment.ie. You cannot appeal your grade directly to QQI. They will only redirect you back to Professional Development (your Provider) who is responsible for carrying out all appeals in accordance with its QQI approved quality assurance process. Any request for an appeal must be made within 7 days of receipt of a Provisional Notification of Results, or a Fail Grade Notification. The cost of a formal appeal is €125 (Appeal Fee) and must be paid at the time of submitting a formal appeal request. The Appeal Fee may be paid by cheque, postal order, or credit/debit card over the phone. You cannot request a copy of your marked assessment(s). This applies equally before, during, or after your decision to appeal your Provisional Grade Notification. If you receive a Fail Grade Notification (refer 9.0 above) you will receive feedback as to where you lost marks and where to focus your effort in order to improve your grade. We will arrange for a QQI approved External Authenticator (EA) to carry out the appeal. This individual will be appointed by us (at our absolute discretion) from a panel of QQI approved EAs. The EA will be independent of the original grading process. The EA will conduct a full review of all documentation in relation to your grade (including relevant IV, EA and RAP reports). They will then determine whether a re-grade is warranted. The re-grade on appeal will be final and cannot be further appealed. Once you have submitted your request for an appeal you may, up until the appeal has been carried out, withdraw your request for an appeal. If you choose to withdraw your request for an appeal however, your Appeal Fee will not be refunded to you. There is a risk that on appeal your grade will be reduced. It may also remain unchanged. The EA who conducts your appeal will provide you with a copy of their report outlining the results of the appeal and their rationale. You will not be provided with a copy of your corrected scripts. You cannot appeal the decision of the EA on appeal. You may however request that QQI conduct a review of our Appeals procedures. This will not result in any change to your grade. All grades (once final) are submitted to QQI for printing. We enter all grades onto the QQI certification system (QBS – Quality Based System). Every two months, QQI will lock the QBS and all grades on the system at this date will be sent forward for printing. Please refer to Appendix 2 for further details on important dates in 2016 regarding the printing of certificates by QQI. QQI will arrange for the printing of certificates beginning the week after the close of the QBS system for grades (i.e. the week beginning after the 15th of the month.) It can take up to two weeks for all certificates to be printed. Certificates are then couriered to our head office in Dublin on the first week of the month following. You will be given 24 hours from the notification of receipt of your certificate by e-mail to inform us if you wish to arrange collection from our offices. You only need to contact us if you wish to arrange for collection of your certificate from our offices. Otherwise we will assume that you wish to receive your certificate in the post. If we don’t hear anything from you by this deadline we will assume that you wish to receive your certificate by post (refer 12.6 below). If you choose to arrange collection of your certificate from our offices, you can either arrange for collection by a private courier company (at your expense), or in person. Certificates must be collected during office hours (9am to 5pm) Monday to Friday. Certificates will only be sent by standard post through the An Post network to the postal address we have on file for you. For operational reasons we cannot arrange for certificates to be couriered or sent through registered post. As per 3.3 above, it is your responsibility to ensure that we have the correct and most up to date postal address on file for you. Please notify us immediately if your postal address has changed. Where your employer has funded your course, either as a public course or through In-Company (on-site) training, your Employer may request that certificates are delivered directly to them. If this arrangement in in place you will be notified by us in advance. All certificates are posted using special protective envelopes to minimise any damage to the certificate during postage. All envelopes also include a return-to-sender address in the event that An Post cannot deliver the certificate to you. However, as you will appreciate, we cannot guarantee that your certificate will be delivered to you undamaged by An Post and/or returned safely to us should the envelope be undeliverable by them. If you are concerned about the risk of your certificate being lost or damaged in the post please contact us immediately to arrange collection of your certificate from our offices in Dublin (refer 12.5 above regarding collection of your certificate from our offices). Please note that in the event of your certificate being lost or damaged in transit it cannot be re-issued by QQI. Please refer to 12.12 below regarding obtaining a QQI Transcript of Results. If on receipt of your QQI certificate you identify an error with your name (for example a spelling error or your married name being used instead of your maiden surname or vice versa), please notify us immediately. You have until 7 working days after receipt of your certificate to notify us in writing of any errors (an e-mail to assessments@professionaldevelopment.ie will suffice). Thereafter, you will be charged a fee of €15 for a Certificate Change Request. You will need to arrange to return your certificate to us (at your expense) in order for us to arrange a new certificate to be printed with the correct details. If you have misplaced your original certificate (including those who failed to receive them safely in the post) you may if you wish arrange for QQI to issue you with an official record (transcript) of all QQI certificates and components achieved by you to date including grades, (“Record of Awards”). Please note this is not a replacement certificate(s). You will need to contact QQI directly to arrange this. We have included a copy of the application form in Appendix 1 of this handbook. QQI will charge you a fee of €15. You will also need to include a copy of your proof of ID (driver’s license or passport). The fee must be by way of cheque of postal order / money order and made payable to QQI. Do not send cash. All applications must be made in writing and must include the appropriate fee. On receipt of a completed application and payment of the appropriate fee QQI will arrange for a hard copy of your statement of results to be posted to you. Please note that in filling out the application in Appendix 1, our “Centre” name is Professional Development and our “Centre Number” is 38038N. Alternatively you may contact us and we can arrange for the transcript of results on your behalf. You do not need to provide us with proof of ID, but you will need to provide us with your PPS number and date of birth. Although you may have provided us with this information in the past, we do not retain this information once you have been submitted to QQI and you have received your certificate. We will arrange for either a soft copy of your Statement of Results to be e-mailed to you, or for a hard copy to be posted to you. You will still need to pay the fee but it will payable to Professional Development in lieu of QQI. Please contact our office for further details. QQI will only print certificates six times during 2016 in February, April, June, August, October and December respectively (“QQI Certification Periods”). To be eligible for inclusion in a QQI Certification Period all Learner assessments must be submitted, corrected, and must have been through the QQI quality assurance process (IV, EA and RAP - refer 7.0 above for further details). This process can take a number of weeks. Therefore, the following cut-off dates will apply during 2016. If an assessment is received before these dates, the overall grade (once the assessment is graded and a minimum of a pass grade achieved) will be put forward in the next QQI certification period. In order to be submitted to QQI for certification (assuming you are eligible) your assessment will need to be received by e-mail (to assessments@professionaldevelpment.ie) before the following cut-off off dates. If your assessment is received after the above cut-off dates it will be submitted to QQI for certification in the subsequent certification period. Example 1 – I submit my assessment on 14 February 2016. When can I expect to receive my certificate? Answer 1 – Your assessment is received after the January cut-off, so it will not be submitted in the February period (12 February). The next QQI certification period is 12 April and the cut-off for receipt of assessments is 2 March. Therefore, (assuming you achieve a minimum of a pass grade) your grade will be submitted to QQI in the April period and you should receive your QQI parchment in early May 2016. Example 2 – I submit my assessment on 1 July 2016. When can I expect to receive by certificate? Answer 2 – Your assessment is submitted just before the 2 July 2016 cut-off, so your grade (assuming it is a minimum of a pass) will be submitted to QQI in the August certification period in August. You should receive your QQI parchment in early September.